This year I became a reluctant Cub Scout leader. I say reluctant because I don’t really consider myself a very creative person. Sure, I can come up with a way to fix something that’s broken or re-purpose something to save a buck. But when it comes to craft projects, I turn to talented people like Jessica, who can create amazing Halloween spiders out of sticks and adorable Halloween hand print art. That’s why I’m a little proud of my creativity for the little Halloween games I helped make for my boys’ Cub Scout Halloween party. I wanted to come up with a few little games that could also count toward their achievements. Fortunately, the Cub Scout Wolves have some electives on games. I created three different Halloween games using inexpensive craft items and things I had around the house. I’m sorry I didn’t take any “in progress” photos because I was so disorganized, but I think you’ll see from my descriptions and photos how easy it is to make these games. The first game I made was a Halloween ring toss game. I picked up a paper maché witch’s hat at JoAnn Fabrics and painted it with black and purple paint. 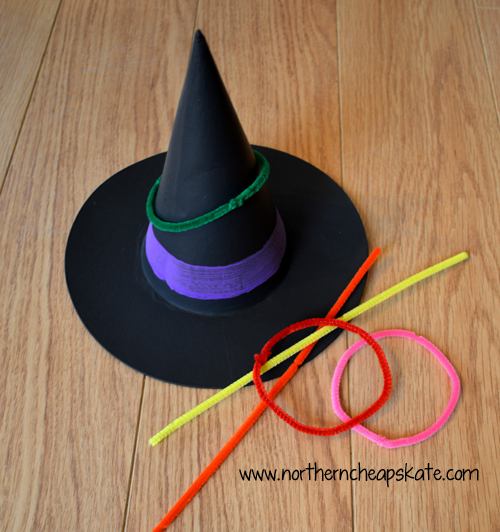 You could also make a witch’s hat, if you’re the crafty type. I had each boy take chenille stems (pipe cleaners, for you old school folks!) and make rings out of them. I placed the witch’s hat on the floor. Then the boys took turns trying to toss their rings on the witch’s hat. Score 3 points for a ringer. Score 1 point for a leaner. For one of the Cub Scout electives, the boys had to play a game in which they toss washers into a pie tin. 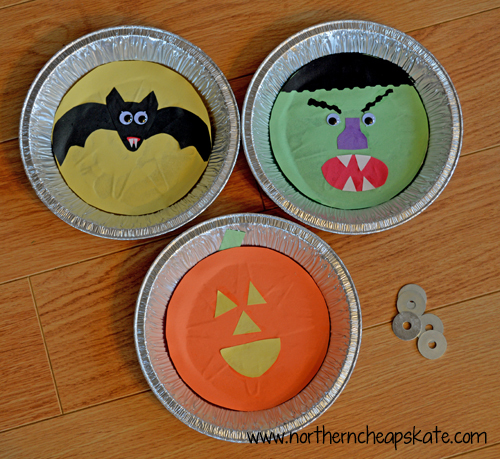 All I did was create a little Halloween-themed art with construction paper and glue for the pie tins. The game requirement was to try to roll marbles between bottles without touching them, with points awarded for succeeding. Instead of bottles, I used disinfecting wipes containers. I simple peeled off the labels, wrapped the containers in toilet paper to make them look like mummies, and added googly eyes and black construction paper mouths. I picked up a bag of little scary Halloween eyeballs from the Dollar Tree to use instead of marbles. Then we spaced out the mummies to make it challenging to roll the eyeballs through. The game turned out cute, don’t you think? 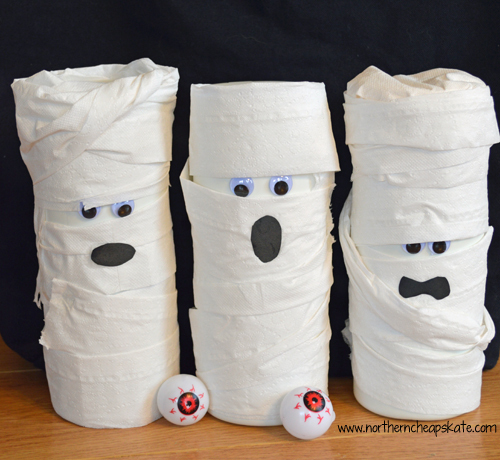 You could also use these mummies for a fun Halloween party decoration. 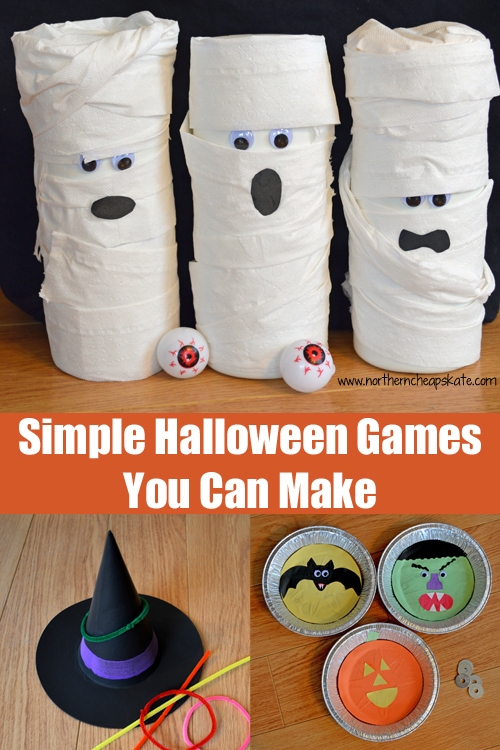 These were very simple Halloween games to make, and I’m thrilled that the boys had fun while meeting some Cub Scout requirements without spending a ton of money to do it.